I’ve been doing a lot of studying recently about the processes that go on in our body sensory systems and our brains as we interact with the world and each-other to learn, create and collaborate. I make no claim of expertise in this area, only compelling personal interest. My hope is that with a deeper understanding of these processes I can gain more insight into why we do what we do in certain business and personal contexts. Perhaps with that insight, I can improve my own cognitive processes and share improvement ideas with others. This blog focuses on just one fascinating aspect of the way our brains interpret and unconsciously filter sensory information, sometimes to the detriment of our best interests. With apologies to my friends in the Human Resources training field, I’m going to expose the secret behind a classic training video which addresses something I’m going to call “attention blindness.” I’m sure there’s a more scientific name for the phenomenon, but I’ll stick with my term for this blog. Some of you may have already been exposed to this video in a training course, but for those that haven’t been exposed to it, here’s the way it goes. You and your fellow trainees are asked to demonstrate your attention focus abilities by watching a video of students tossing a basketball back and forth to each-other, and counting the number times the ball changes hands. You’re told that you’ll compete with each-other to see who comes closest to the correct answer. The instructor now starts the video. 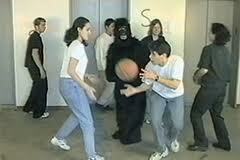 As advertised, you see a group of students in a classroom, and they start tossing a basketball to each-other. You and the others in your class begin to count the throws. A moment or two into the video, in the midst of the ball tossing frenzy, in the background, someone dressed in a gorilla suit can be seen, casually walking through the scene from screen right to screen left. None of the students tossing the ball in the fore-ground seem to take any notice of this event and after a few moments of additional ball tosses, the video ends. At this point the instructor asks the trainees not to confer with each-other and to write down on a piece of paper, how many ball exchanges they counted. The instructor then brings the class back together and asks individuals for their numbers. Several students offer their estimates of the number of exchanges, often with a fairly wide range of variability. At his point the instructor stops the discussion and asks if anyone saw anything unusual during the video. Typically only one or two people have noticed the guy in the gorilla suit and mention it. Also typically, the rest of the class looks puzzled and skeptical. An argument then ensues between those who didn’t see the gorilla and those who did, which is eventually settled by the instructor who replays the video. This is followed by a discussion of “attention blindness” between the “overly pleased with themselves” minority of people who saw the gorilla, or at least claim to have seen it, and the somewhat embarrassed majority who admit that they didn’t see it. The instructor facilitates the discussion so the class explores the implications of this phenomenon for our businesses and our lives in general. • We can get so focused on some specific sub-set of activities in our business projects or our personal lives that we’re oblivious to “the gorillas in our midst”? • We’ve introduced so much complexity and information processing demand into our lives, that no one person can possibly keep track of all of the important things? • Awareness that KU’s exist and affect us every day. Be cognizant of the likelihood that there are things you need but don’t know, and that someone else does have that knowledge. • Realize that no one can really multi-task. They may be very good at switching focus from one task to the next, but your brain isn’t wired to perform well on more than one thing at a time. This means delegation and sharing work responsibilities for work. • Make sure you have the right set metrics and information feeds and that more than one person is assigned to monitor and interpret the information and empowered to share it and make decisions without fear of negative consequences. • Build cognitive diversity into your organization. It may lead to occasional conflicts, but it’s less likely they’ll miss something, ignore it or experience group think. Note: No gorillas were harmed in the creation of this blog. This entry was posted in Humor, Leadership, Personal Development, That's Life and tagged attention blindness, Knowledge Management, Known Unknown, learning, risk. Bookmark the permalink.